Our chiropractors and osteopaths are highly trained in diagnosing the cause of your symptoms, whether you are complaining of pain, pins and needles, lack of movement, numbness or a combination of all of them. The correct diagnosis or cause of your symptoms is important to establish before treatment commences in order to provide you with the correct treatment management. Our practitioners will use a combination of physical assessment, clinical tests and orthopaedic tests and/ or combined with diagnostic imaging such as x-rays, ultrasound scans or MRI scans if deemed necessary. When making a diagnosis the practitioner will be taking into consideration the reasons why you are experiencing the symptoms, for example why one side of the body is affected more than the other. They will assess your posture, looking for asymmetry and for muscle imbalances and weaknesses that can be addressed and corrected. They will ask you questions about your day to day activity, sleeping pattern/ position and hobbies or personal interests in order to determine how this may be affecting your posture and therefore symptoms. We want our patients to understand that pain is just a symptom of an underlying cause and that treating the underlying cause will prevent the symptom/s from returning. 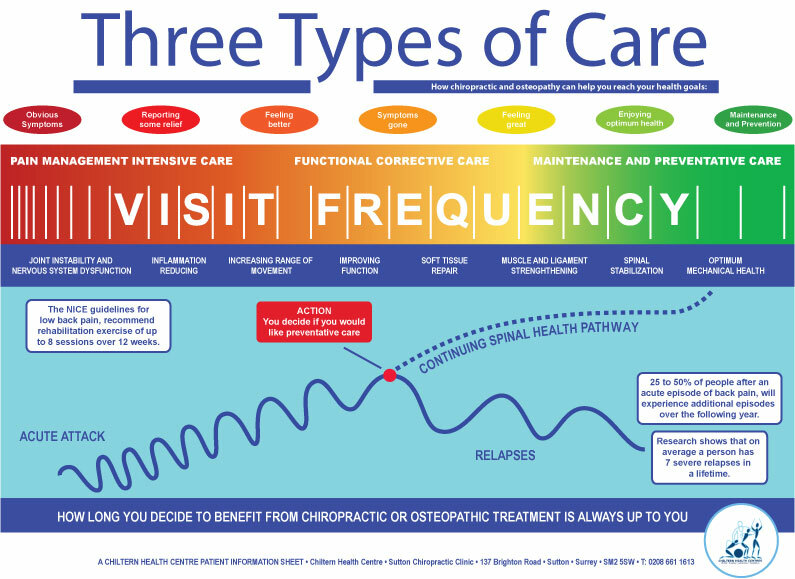 The “Three Types of Care” chart demonstrates the progression of spinal health from the first time you visit it us with spinal related symptoms to being symptom free and with improved mechanical spinal health. Symptoms arising from dysfunction in the spine are varied and can be widespread, such as neck pain, back pain, muscle spasm, arm or leg pain with or without pins and needles, numbness or weakness. Many patients consult our practitioners after an acute attack of back or neck pain. At this stage, your treatment will be focused on “Pain Management Care” and you can expect to be receiving this type of care twice a week until your symptoms improve. It is common to have good days and bad days during this period, with minor relapses as you try to increase your activity levels. As your pain level and relapses decrease so will the frequency of your visits to your practitioner, at which point the main focus of treatment is on restoring the health of your spine and muscles through “Functional Corrective Care”. It is common for patients to stop coming for treatment at this stage as they are feeling symptom free and have returned to normal activity levels. However research has shown that 25% to 50% of people after an acute episode of back pain; will experience additional episode over the following year. It is therefore a recommendation that our patients continue with “Maintenance and Preventative Care” which may vary from one patient to the next on the frequency of the visits, dependent on their general spinal health, lifestyle and social factors. The aim is to try to space out the interval of your maintenance visits to once every 3 months. Of course how long you decide to benefit from chiropractic or osteopathic treatment is always up to you. The treatment you may expect to receive during visits is varied and dependent on what your practitioner thinks is suitable for you at the time and of course what you feel comfortable with. Rehabilitation through a specific exercise program tailored to your condition. The NICE guidelines for low back pain recommend rehabilitation exercise for up to 8 sessions over 12 weeks. A common cause of shoulder pain is damage to the rotator cuff muscles and tendons, which support the shoulder joint and allow for a wide range of movement. Damage may be the result of an injury to the shoulder or from progressive wear and tear that you might expect from repetitive shoulder activity. Over time old shoulder injuries and repetitive activities can cause the development of bone spurs or build up of calcium deposits within the tendons, causing irritation or damage. This persistent irritation can cause inflammation, tearing or even a complete rupture of the tendon resulting in pain and reduced range of movement. Often pain from a rotator cuff injury is described as a dull deep ache in the shoulder. 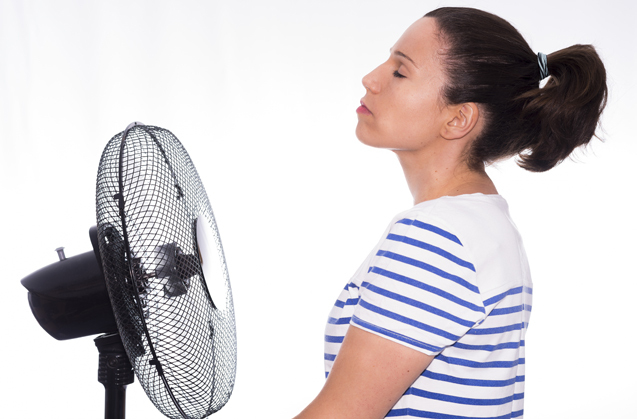 Lying on the affected side may disturb sleep and it may be difficult to comb your hair, fasten a bra or scratch your back. Often the arm feels weak so that simple things like lifting a kettle or opening a door are painful and awkward. How do you know you have a rotator cuff injury? There are a number of orthopaedic tests that your chiropractor or osteopath can perform to indicate whether there is damage or irritation to the rotator cuff. 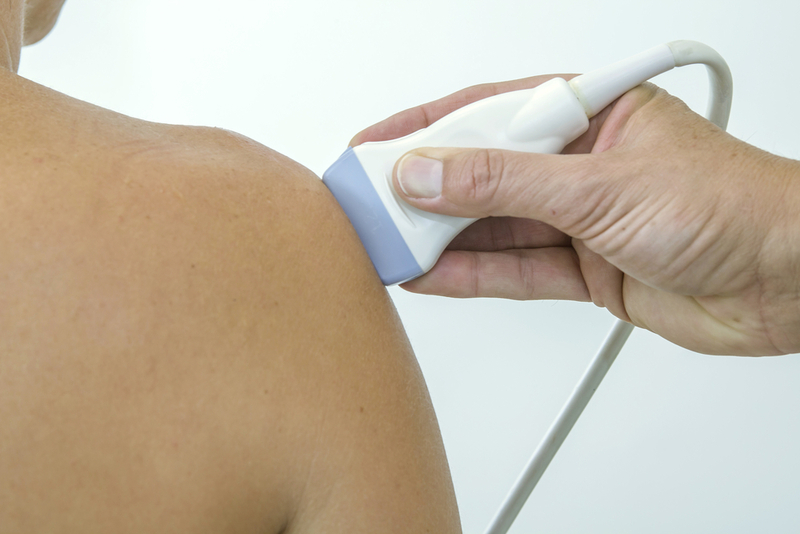 Diagnostic ultrasound of the shoulder is a fast, affordable and dynamic way to examine the rotator cuff and has been shown to be as reliable as MRI. X-ray is helpful for the diagnosis of bone spurs but is not able to assess the tendons or muscles. What treatment should I have? Depending on the severity of the injury, chiropractic and osteopathy can help to reduce pain and increase range of movement. In more severe cases surgical intervention may be needed, therefore a quick diagnosis is needed, as some surgical procedures are time sensitive. If you are concerned that you have damage to the rotator cuff tendons it is wise to have it assessed as soon as possible. The Chiltern Health Centre can offer both chiropractic and osteopathic consultations and can also provide a diagnostic ultrasound and x-ray service. 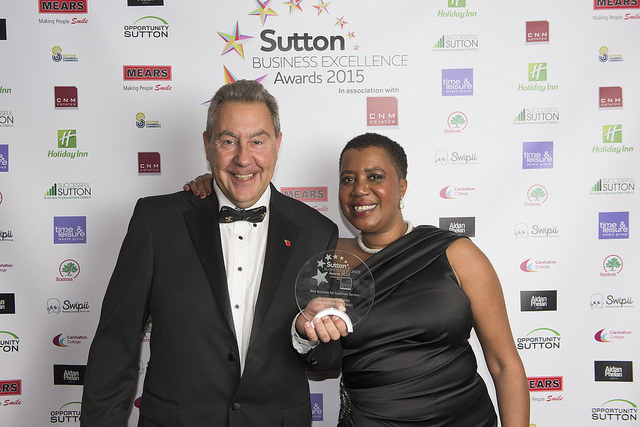 The Chiltern Health Centre (Sutton Chiropractic Clinic) is not only celebrating 40 years of health care provision, but now has the prestigious Sutton Business Excellence Award for Customer Service to add to its collection. Brian Hammond, founder of the clinic attended the gala dinner held at the Holiday Inn in Sutton on Friday 6th November on behalf of the clinic and it’s team of practice staff. The awards, backed by Sutton Council are open to any business throughout the borough and aim to recognize dynamic, innovative and successful businesses in Sutton. Potential award recipients are evaluated on a number of business aspects including demonstrating ‘first class” customer service, market and customer engagement excellence and training/ motivation of staff. The winners are then selected by an independent judging panel made up of local industry leaders and business experts. The Chiltern Health Centre is honored and delighted to receive this award as it shows recognition for our efforts and dedication to our patients, community and the chiropractic and osteopathic profession. None of this would be possible without the back up and support from our team of practitioners and administrators and we would like to thank them for all their hard work and commitment over the years to make the Chiltern Health Centre the practice it is today.